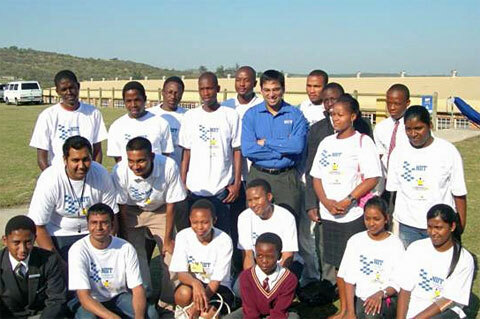 Historic Moments: Anand in Africa! 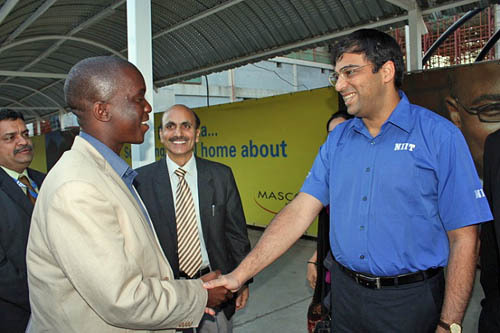 The President of Botswana Chess Federation Tshepo Sitale shakes hands with Viswanathan Anand. Viswanathan Anand's brief tour of Africa (Botswana and South Africa) fell under the radar for most of the chess world, but was nevertheless an important occurrence. The current World Champion brought goodwill and with it some residual benefits from his sponsor NIIT, an IT training company. Anand is the first sitting World Champion to visit Africa as part of a goodwill tour. Dr. Max Euwe visited southern Africa as part of a fact-finding mission as FIDE President. Anatoly Karpov visited South Africa in 1993 to give lectures and simultaneous exhibitions. However, Anand's trip came as he prepares to defend his title against Veselin Topalov next year. He had a short stint in South Africa before going onto Botswana. The question remains on the effect of Anand's visit. Perhaps it will yield some long-term benefits. The trip was not widely discussed on the continent and there was little coverage. Despite the poor coverage, let us hope that this will serve as an opportunity for chess growth throughout the continent. The World Champion with NIIT students.